One of the most inspiring local stories of the year came as a result of a Twitter exchange between Chris Strouth, local musician/filmmaker/producer and a man called Scott Pakudaitis who gave him his kidney. The story got a significant local coverage, and now it's getting the national recognition it deserves. 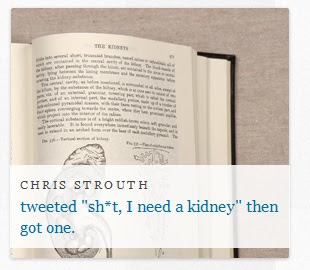 Chris's story is currently featured on Twitter Stories, a new website about people who have used Twitter in an interesting way. Do you remember how it all started? With a single tweet saying: "Sh*t, I need a kidney."